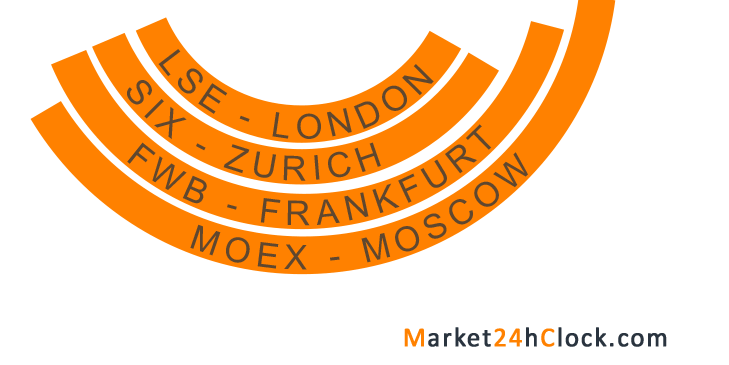 Market 24h Clock shows the European session as a block of lighten up in orange color trading hours for following Stock Exchanges - LSE London, FWB Frankfurt, SIX Zurich, and MOEX Moscow. European session is more often referred to as the London session. London is the first largest Forex trading centre in the world, ca. 30% of all Forex transactions happen during London trading hours. Market share of more than 40%. This is the most liquid trading session. Forex trends begin during the trading hours of the Europe and will usually continue untill the beginning of the U.S. session. Liquidity goes down closer to lunch time. Half of the 12 major currency pairs surpass the 80 pips line. Any pair can be traded. Majors - EUR/USD, GBP/USD, USD/JPY, and USD/CHF. NZD/USD, AUD/USD, EUR/CHF, and AUD/JPY, with an average of 50 pips range. Volatility in pips of the major currency pairs during the European trading session.